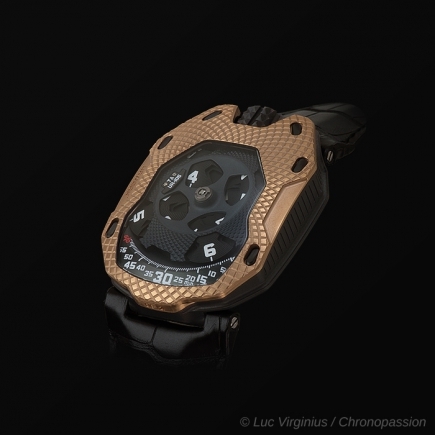 The UR-210: Never has a timepiece displayed such feedback and attachment to its owner. 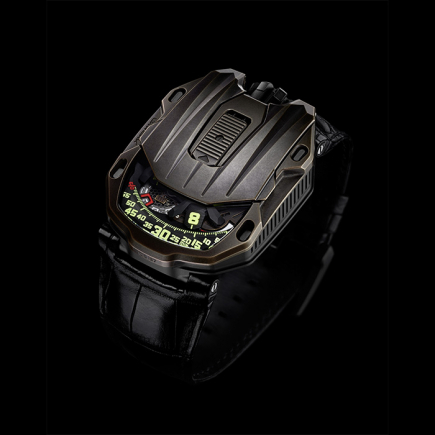 In a first for a wristwatch, URWERK’s UR-210 highlights and monitors the symbiotic relationship between man and his mechanical watch. 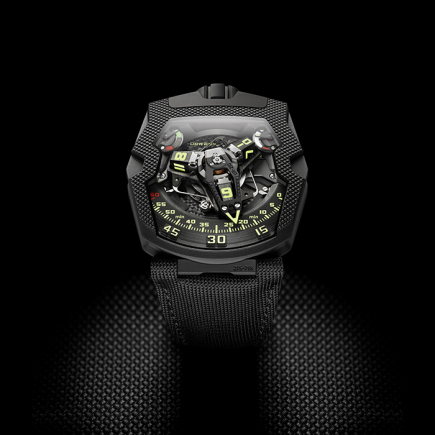 While the UR-210 is characterized by its original URWERK time display, of equal note – and with reason - is the UR-210’s personalized communication with its owner. 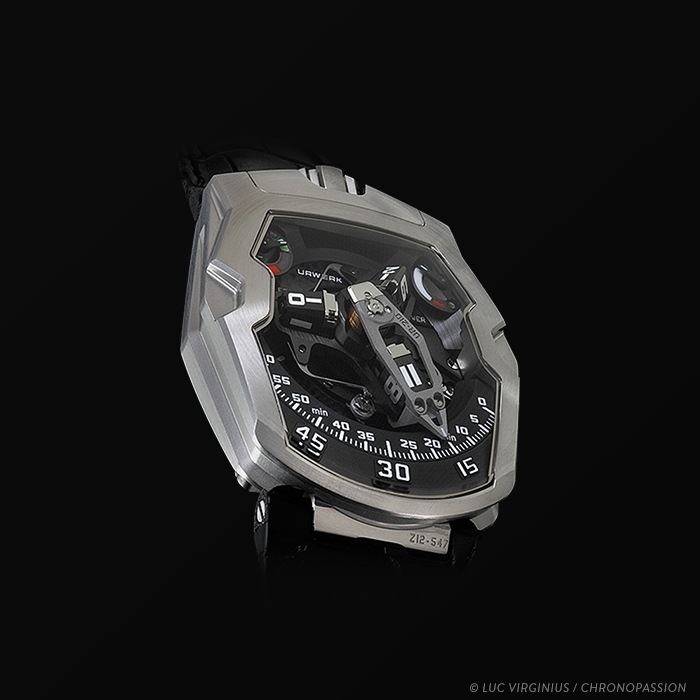 If the UR-210 displays a cold chronometric precision in counting the hours, it plays the card of emotion when it echoed the tempo of your life: “The UR-210 embodies the symbiotic relationship between man and his watch. This quasi-biologic machine could reveal more about you than any other object in your possession,” explains Martin Frei. 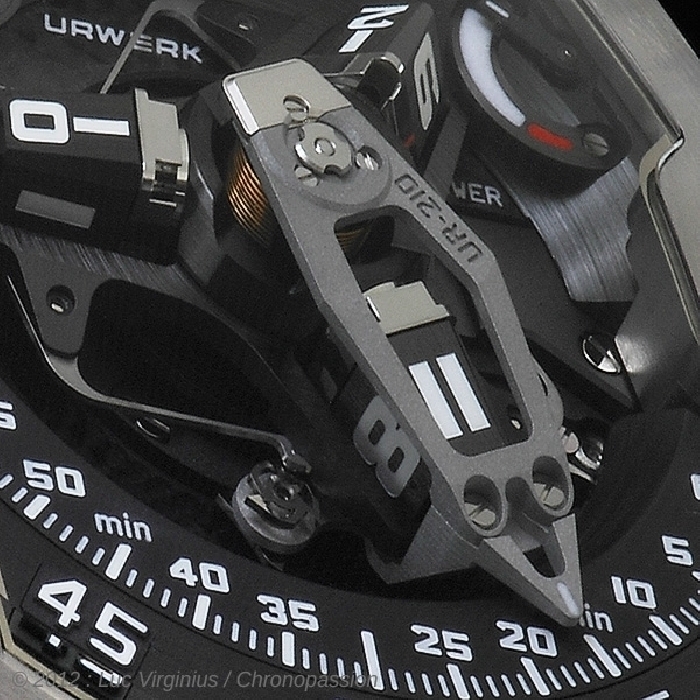 The dial of the UR-210 features a traditional power reserve indication at one o’clock. In a near mirror image at 11 o’clock we find a similar indication. No, it isn’t a duplicate fail-safe, but something much more important which deserves our full attention, because it is actually a world-first complication that indicates winding efficiency over the last two hours. When you are comfortably nestled in your armchair, the indicator will be tending towards the red zone to tell you that your UR-210 is not being wound enough by its automatic rotor and is running on stored energy. 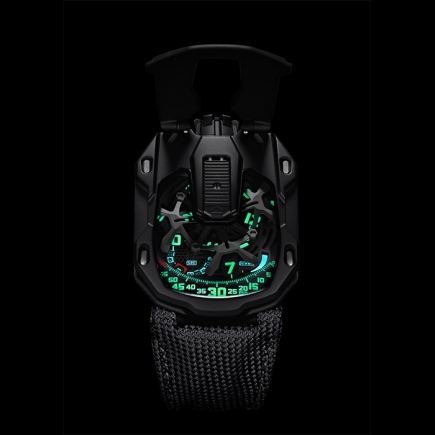 However, if you are moving around energetically, the indicator will point towards the green zone, a sign that you are replenishing your watch with new energy. This entirely new indication does not measure mainspring torque, but calculates the difference between the consumed and generated energy of the mainspring. 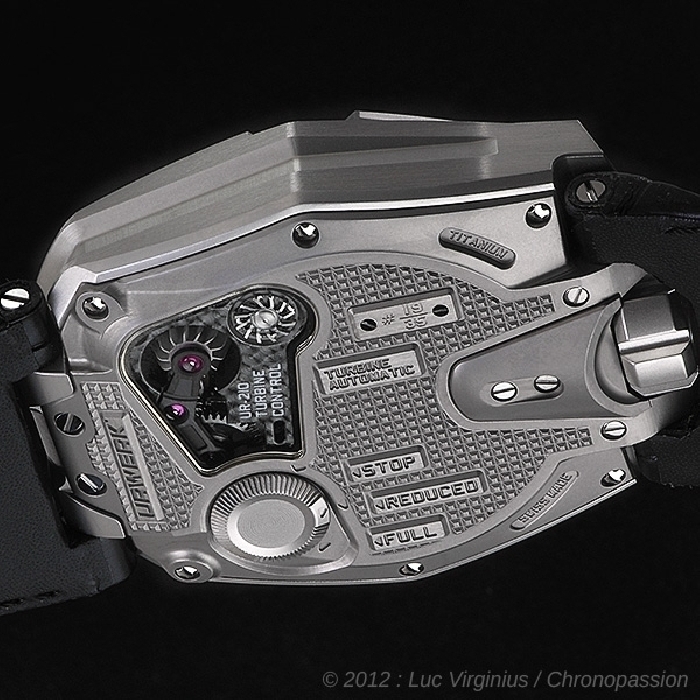 Armed with knowledge of both winding efficiency and available power reserve, you are now able to intervene. 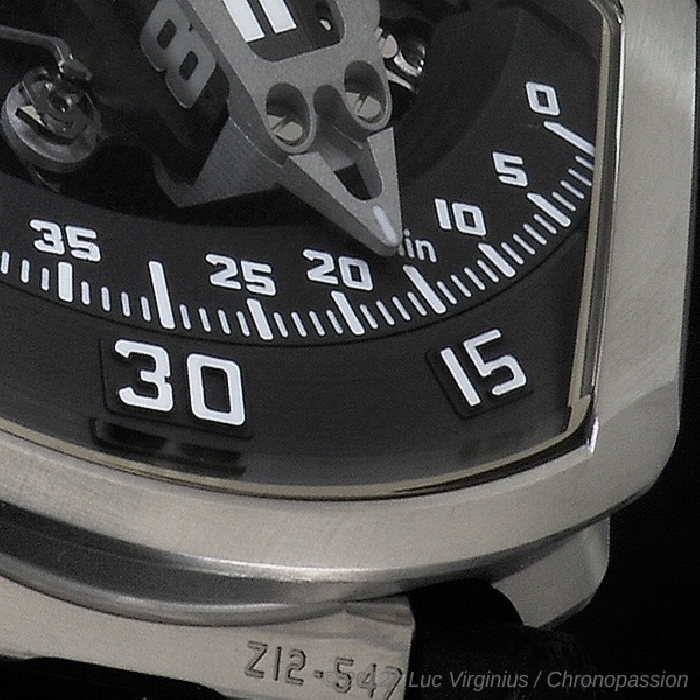 If your UR-210 indicates an insufficient supply of energy, you can position the winding efficiency selector (at the back of the watch) to “FULL”. 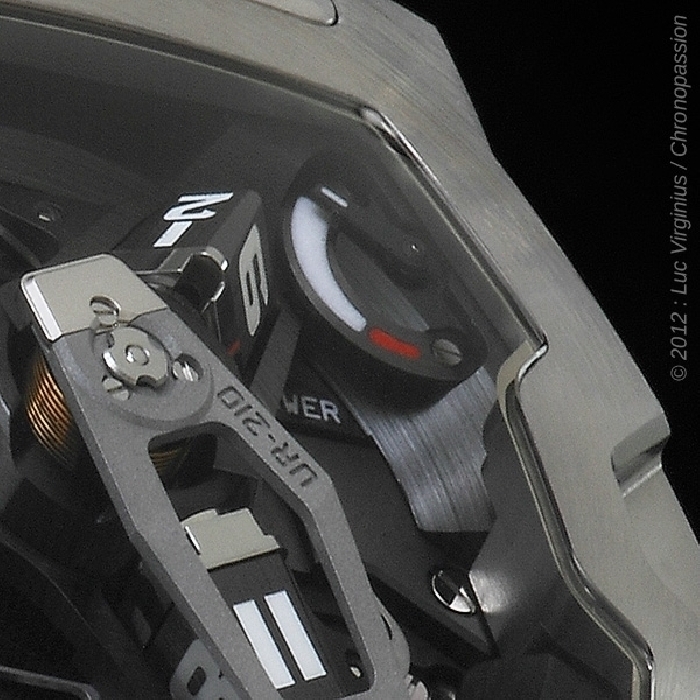 The rotor will then convert the slightest movement into stored energy. In this configuration, a turbine connected to the rotor provides smooth, unimpeded power. But if you are more active, then that may provide more power than required and unnecessarily wear the mechanism. In that case, you would position the winding efficiency selector to “REDUCED” to engage the rotor damping system. An air turbine compressor mounted on ruby bearings __spins and creates internal resistance – enough friction to slow down or dampen the automatic winding rotor. In “STOP” mode, the automatic winding system is disabled completely and the UR-210 runs off reserve power and may require manual winding. Back to the dial side, the UR-210’s satellite complication with retrograde minute is both highly original and totally explosive. 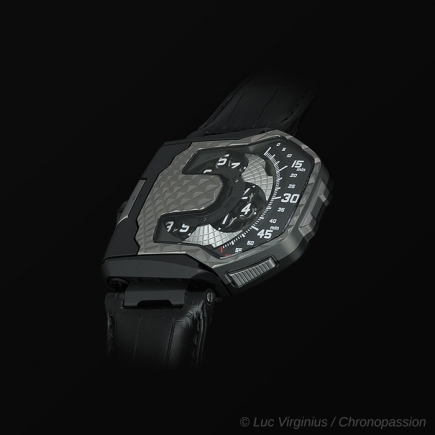 The principal feature is a high-tech, oversized, three-dimensional retrograde minute hand. Its function is to enclose the hour satellite and indicate the time as it transverses the 0-to-60-minute scale. This one-hour journey through time, tracing an arc of 120°, is smooth and fluid. But the true nature of the piece is revealed at the end of the 59th minute. 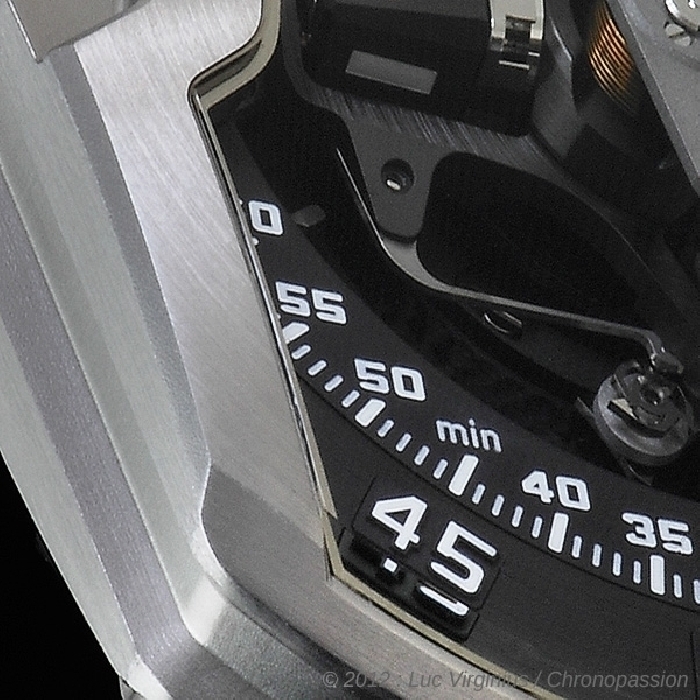 Then a sharp distinct “click” signals the return of the minute hand to its starting point. In less than 0.1 of a second the hand flies back to dock with the next hour satellite. This lightning fast retrograde system is based on three key elements: • A central axis set in ruby bearings provides excellent stability for the satellite/retrograde complication. A cylindrical marine chronometer type spring runs vertically around the axis and generates the optimal tension required for the retrograde minutes flyback. 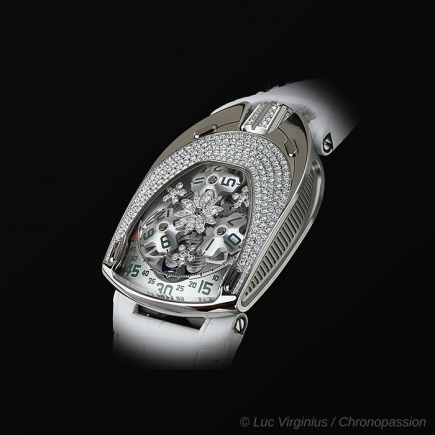 • A minute hand, which also forms a frame for the hour satellites, displays the time in an extraordinary way. Milled from aluminum to exacting tolerances of approximately 3 microns, the whole structure has a total weight of just 0.302g and is counter balanced by a brass weight. This three-dimensional cage offers rigidity as it transfers energy from the cylindrical flyback spring in the top center of the carrousel to the double-star gear underneath. 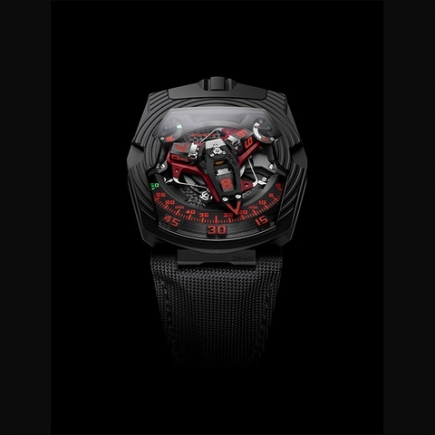 • A double coaxial star-shaped cam regulates the retrograde mechanism through its gearing and its rotation defines the trajectory of the minute hand. When the minute hand reaches 60, the double star trips a (one of three) hockey-stick shaped spring under the mechanism, which liberates the minute to fly back to the next hour satellite at 0-minutes. “In terms of the degree of evolution of the satellite carousel, I feel with the UR-210 that we have reached the pinnacle of what we can do with this complication.” explains Felix Baumgartner. 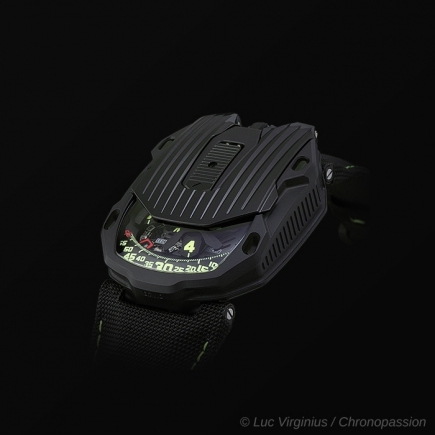 “After the presentation of our über complicated UR-1001 Zeit Device, we wanted to experiment again on an imposing scale. 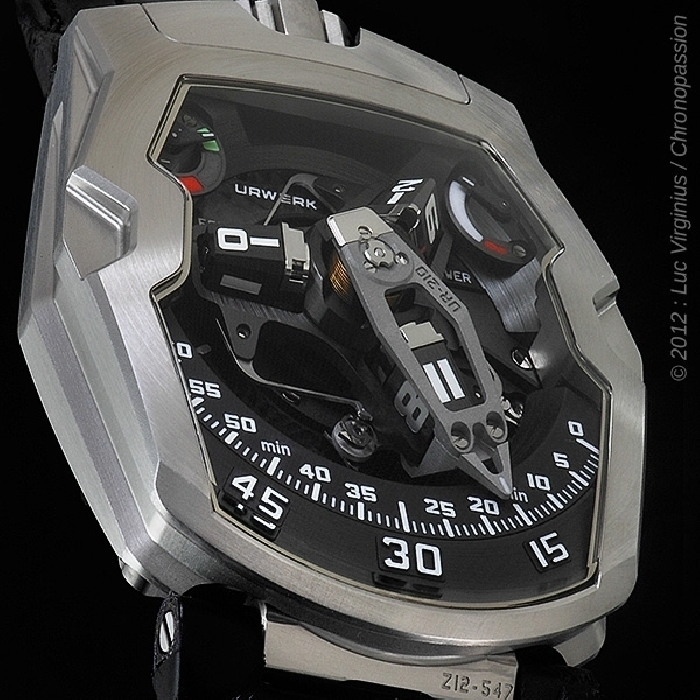 The minute hand in the heart of the UR-210 is not just big, it is massive! 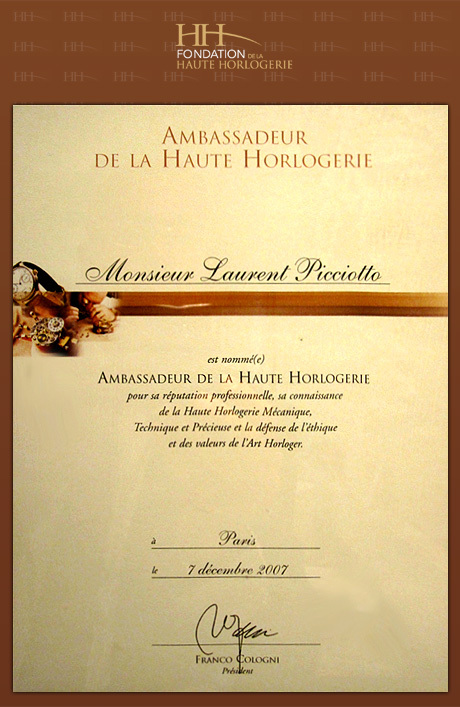 And yet it presented us with a considerable challenge because it requires fine, delicate workmanship. 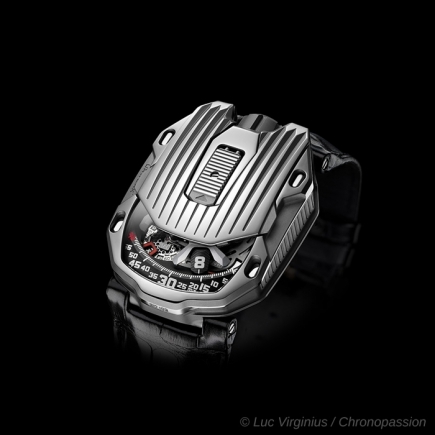 It envelops the hour satellites and demands machining to extremely fine tolerances.” Martin Frei adds: “More than any other URWERK piece, the UR-210 catches the attention. The eye is inevitably drawn to the winding efficiency indicator… it’s almost a magnetic attraction. 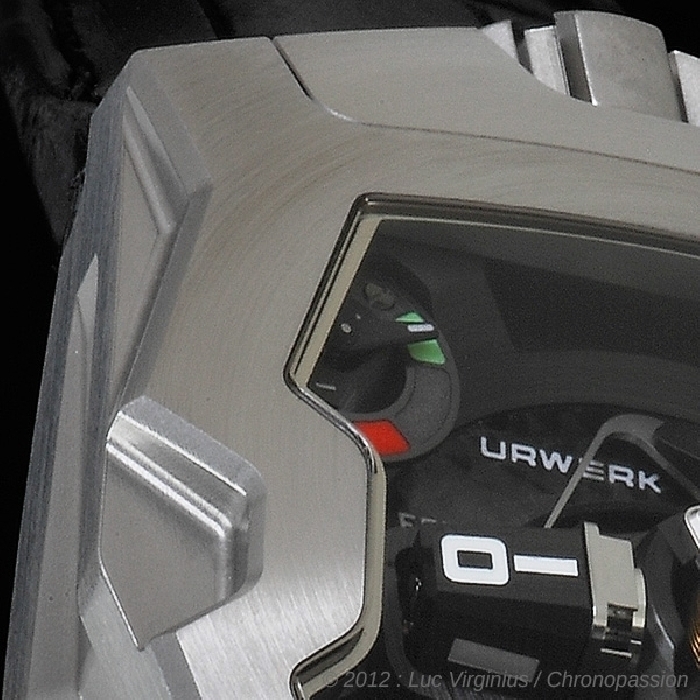 The UR-210 is not really a watch but rather a living mechanism grafted onto your wrist. We have nicknamed the UR-210 the Maltese Falcon because we see it as the stuff that dreams are made of .